Today’s Withee Public Library is an important, modern community resource for information and pleasure. The Heritage room is a sunny reading room featuring a historic newspaper reporting President Lincoln’s assassination as well as local newspapers dating back to the 1920s, historic photos and books. Local oral histories, starting in the 1970s capture stories and events of past years, told by area people. The interviews have been digitized and can be found on YouTube. If you would like to do an oral history interview, please pick up information in the library. The Village of Withee was founded in 1870, and named after a school teacher from Maine, W.H. Withee. It was incorporated as a village in 1901. The Soo Railroad brought in booming business to the area, developing into the principal shipping point for D.J. Spaulding Mills. Withee retains all its small town charm with a friendly population of 487 people. 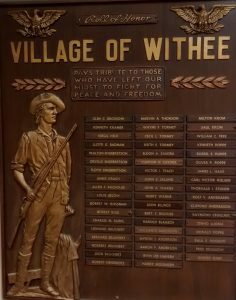 The Village of WIthee can be proud of its library, which has been in existence since 1919, when a group of women affiliated with the Red Cross honored the veterans of World War I by dedicating Withee’s first library to their memory. Armed with about $165.00 which had been raised for activities on behalf of the veterans, these women launched the library and paid for a memorial plaque, inscribed with the names of Withee war veterans, which remains mounted on a concrete block in Withee Lions Park. The first Withee Library was housed over the old withee Bank, with Mrs. Glyde Nielsen serving as the first librarian. The library moved downstairs when the bank moved to its new building in 1924. 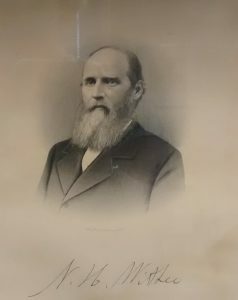 Withee Bank President, William Tufts, contributed shelves and furnishings. Later, the Withee Village Board helped with building rental payments and book purchasing funds. Most books were purchased from Eau Claire Book and Stationery, costing anywhere from 28 cents to $1.35, in hardcover form. In January, 1986, 40 volunteers moved the Withee Public Library to the former Withee School Building. 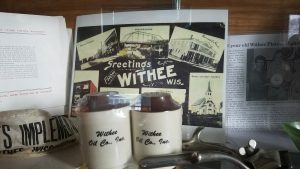 Seeing the need for an improved library, the Withee Library Trustees enlisted the aid of many Withee School Alumni to accomplish their goal. The present Withee Library, funded by the Village of Withee and Clark County, relocated in June 2010 to where the Withee bank stood in 1924, to honor those who had helped make the new library a reality. The interior library furnishings were donations of equipment, cash, labor or memorials from Withee School Alumni, community citizens and friends of the library. Large glass showcases permanently house local school and area memorabilia. Description of what is on he YouTube Channel goes here. Description of what is on he YouTube Channel goes here. Description of what is on he YouTube Channel goes here. Description of what is on he YouTube Channel goes here.